Remove the cupcakes from the oven to a wire rack and cool completely before frosting. For the cream cheese frosting: Add the cream cheese, butter, maple syrup, and salt to �... We were invited to our neighbor's house for Sunday dinner and I wanted to make a dessert to feed a crowd. I was originally going to make my famous New York style cheesecake with a fresh blueberry sauce, but my cheesecake pan is missing the bottom part. 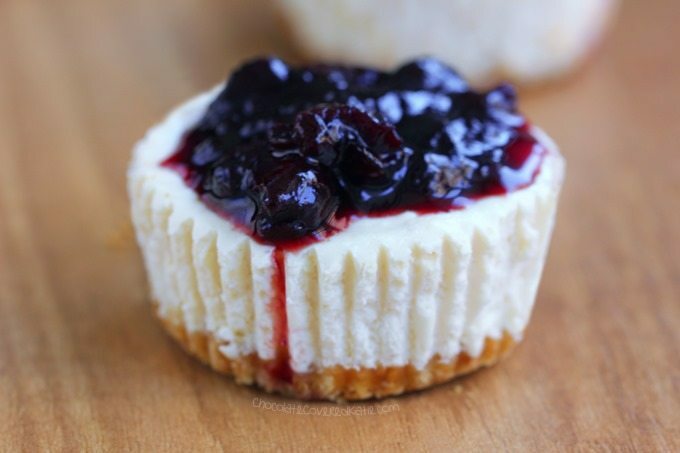 To make this cheesecake, the first thing you�ll do is make the cake bottom. I dyed mine a shade of teal and added sprinkles, of course! You�ll want to use the same springform pan that you�ll use later to bake the cheesecake. Directions. Preheat oven to 275 degrees. Line muffin tins with paper liners, placing 1 whole oreo at the bottom of each liner. With an electric mixer on medium-high, beat cream cheese until smooth, scraping the sides of the bowl occasionally. Bake in the oven for 20-30 minutes, or until the cheesecake filling is set, but still slightly wobbly in the middle. Remove the cupcakes from the oven and set aside to cool for 30 minutes. Om nom nom. Hayley, these look fabulous. I have to make cupcakes for my niecey-poo�s 1st birthday and these would be a great addition to the mix. We were invited to our neighbor's house for Sunday dinner and I wanted to make a dessert to feed a crowd. I was originally going to make my famous New York style cheesecake with a fresh blueberry sauce, but my cheesecake pan is missing the bottom part.